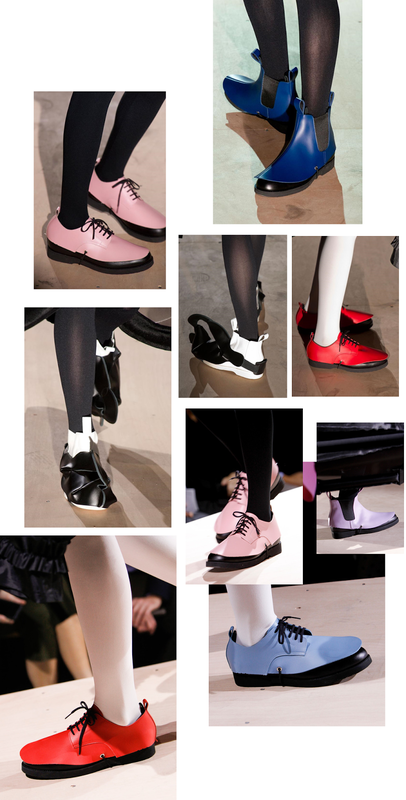 The clothes shown during Comme des Garcon ss14 might be beyond for my brain to decipher but the shoes were so so so unbelievable !!! Just when we've thought that adding lucites on shoes were the most avant thing we'd seen, Rei Kawakubo's playful formula devised a new kind of new. We've seen how Raf Simons hybrized sneakers and sandals , Margiela had always created mind-blowing shoes ever since, and the rest had always been so keen in stepping up their footwear game. But this is something beyond the beyond. Well, definitely not 90's , not futuristic but somehing so real and theatrical and organic and creative. I'm smelling a lot of DIY's here (yes?). I will try to attempt though haha !! I love love derbies and chelsea boots right now so when I saw these shoes, I instantly forgot the Dr. Marten's that Ive been lusting for a week now. the white chelsea boots with the black material look amazing!